Batch processes have been around for many millennia, probably since the beginning of human civilization. Cooking, bread making, tanning, and wine making are some of the batch processes that humans relied upon for survival and pleasure. The term batch process is often used to refer generically to both batch and fed-batch operations. In the former case, all ingredients used in the operation are fed to the processing vessel at the beginning of the operation and no addition or withdrawal of material takes place during the batch run. In the latter, material can be added during the batch run. For brevity, the term batch is used in this text to refer to both batch and fed-batch operations when there is no need to distinguish between them. The term fed-batch is used to denote addition of material in some portions of an otherwise batch operation. In sourdough fermentation, proliferation is brought about by a ripe sourdough (alternatively, by one in which metabolic activity has ceased) used as an inoculum (23). A portion of this sourdough is used to make a fresh mix, together with flour and water. All sourdough preparations are bulk fermentations, the sourdoughs acting as preliminary doughs to produce bread doughs. 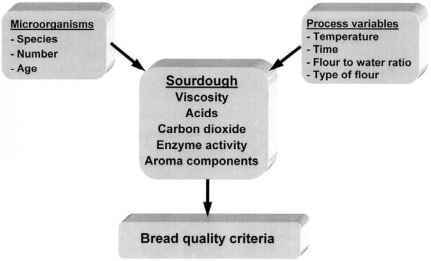 The proportion of inoculum in the sourdough determines the process and method of fermentation, depending on the ripeness of the sourdough required for making bread dough. Based on the ratio of fermented flour to total flour, the inoculum can range between 1 and 50 . Whole-meal cereals are good sources of minerals such as K, P, Mg, Fe, and Zn but without treatment, the bioavailability is poor for minerals stored as phytate, an insoluble complex with phytic acid (myoinositol hexa-phosphoric acid, IP6). The content of phytate is 6 mg g rye grain (115), 3-4 mg g in flour of soft wheat and 9 mg g in hard wheat flour (116). Phytate accounts for more than 70 of the total phosphorus in cereals, and it can be degraded during the bread-making process due to the activity of endogenous phytase and thus liberate the bound minerals when the ester-bound phosphoric acids are hydrolyzed. The pH-optimum of rye phytase is found to be at pH 6.0 (115). 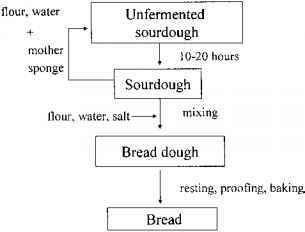 There are three basic processes in commercial bread making straight dough process, sponge-and-dough process, and continuous-baking process. The choice of which process to use is up to the manufacturer and the equipment available in the baking plant. Table 36 lists the basic steps in the different processes. The major difference is in the way the dough is prepared and handled (28-30). The major industrial enzymes from fungi are hydrolytic, and the major producing species are A. oryzae and A. niger. Amylases and glucoamylases are used for turning starches into sugars and oligosaccharides. Pectinases are applied in fruit juice clarification. Aspergillus proteases are used in bread making and in chill-proofing beer, and a thermostable phytase is used widely in the animal feed industry as an additive. Representative commercial enzymes produced by Aspergillus are listed in Table 3. Sourdough is essential in rye bread making, and the tradition of rye sourdough fermentation corresponds to the rye-growing areas in the north, central, and eastern European countries, including the Baltic States, where rye bread constitutes a considerable amount of the bread consumption. 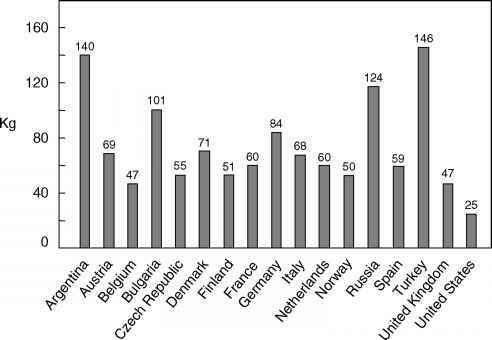 Rye sourdoughs have been characterized from Finland (17), Sweden (18), Denmark (19,20), Germany (21-23), Austria (24), Poland (25), Czechoslovakia (26), Russia (27), and Portugal (28). However, Henry and Saini (71) found only small amounts of low-molecular-weight sugars in rye (0.7 sucrose and < 0.1 of glucose, fructose, raffinose, and stachylose). The content of pentosans (arabinoxylans) in rye flour is high (6.5-12.2 ) (72) compared to wheat flour (2-3 ) (73), and they can be degraded to the pentoses xylose and arabinose by the corresponding enzymes during the bread-making processes (74). Such breads broken into water and allowed to spontaneously ferment in jars were of course the origins of beer. Preferences for bread per se shifted from a flat form to loaves, and wheat replaced barley as the main raw material, although rye has long played a major role in bread making in central and northern Europe. Fig. 12.1 Making bread.